We began the day on Thursday with Sister Jane calling us again and again “to Wake Up, to Listen, to Be Present, to Trust,” thus emphasizing how important these attitudes were as we entered into the sacred work of the day, reflecting on our Constitution and the necessary changes needed to make it more relevant. The gestures that accompanied the words and music of our morning prayer seemed to release an energy within us—yes, the Spirit rising to engage the tasks ahead. We were reminded: the Constitutions are for us not only a proclamation of who we are, but also God’s living word. Fortified with that awareness, we set off reverently. As we proceeded, there was a shift in the spirit among us, evidenced in the struggle for greater clarity and understanding, as well as for the pressing need: a more contemporary expression of this sacred document. Our Communion Service began with the call: O Healing light of Christ, transform us, life-giving source of hope. A little later, the Prayer for the Community, prayed in parts, focused on the Wholeness and Healing we all need and for which we long. Both the verses of the Communion song and the closing song renewed our spirits for the afternoon session. Refreshed, we entered into the afternoon session. Being awake—being Present—listening respectfully, as our two candidates for president described their vision of service and responded to the questions that were raised. 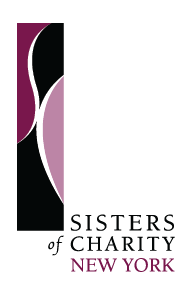 We then listened intently to the history to the Office of Sponsorship Services and the wisdom that led to the creation of the Sisters of Charity Ministry Network. One could palpably feel the Spirit rising as Jennifer Coffey, Esq., Sarah Stevenson, Ph.D., and Christopher Mills, MD, spoke with such conviction and gratitude of how the Sisters of Charity and their Mission had affected their individual lives, moving them to the ministry of SCMN Board Member. Our day did not end there. An evening reception brought together many of our lay colleagues who have labored with us, as well as supported our ministries with their gifts and talents. The stories flowed as one after another spoke, laughed, and joked about their many experiences with Sisters over the years. Some were described as “easy going,” others as those who made them toe the line with phrases like, “you’ll do it this way,” but ALL had a passion for the mission. It was quite clear that those encounters were the source of our colleagues years of respect and collaboration with the Sisters of Charity. All had a good time. What a wonder-filled ending to our day! Wow! Ain’t that the truth. We had sister Antoine who could wield the pointer like d’Artagnan and Sisters Carmel, Virginia and Dorothy who were like Heaven’s angels. Can’t speak for the “Girls’ Department” but sure heard similar stories. ALL certainly DID have a passion for the mission.